Over the past three years, Landfall Games has made a name for itself on April Fools day. The Swedish developer has released a spoof game on this day every year for the past three years. This year, however, they’ve decided to actually release a real game. Since 2016, Landfall has been working on Totally Accurate Battle Simulator, a physics-based tactics simulator letting you experience a ragdoll-based take on combat through the ages. Every year, development takes a brief break so that parody games – like Supertruck and Totally Accurate Battlegrounds – can be released on April Fools. This year, however, the release isn’t just a joke. 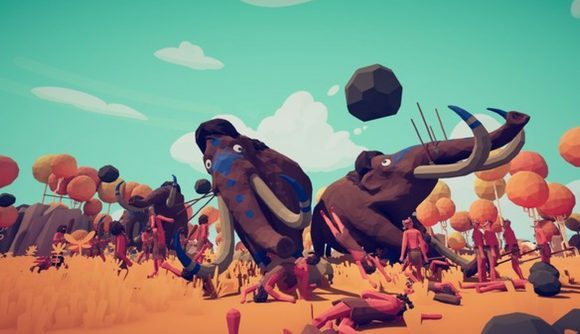 Totally Accurate Battle Simulator released into early access on Steam earlier today. Landfall say they’ve opted for early access to help fans “have a more direct way to participate in finishing the game,” and that a full release of the game should be available within a year. More factions, as well as a unit editor, and player creation tools are planned before that point. Despite the splash of cynical joy that was the release of battle royale parody Totally Accurate Battlegrounds last year, I would say Landfall has outdone itself this year, releasing its new game on the one day fans would never expect it to have done so. If you fancy some more spring silliness, you can check out our April Fools roundup, covering everything from For Honor’s Rabid invasion to the surprise announcement (not really) of Dota 3.